A revamp widened sidewalks, added benches, and reduced traffic. 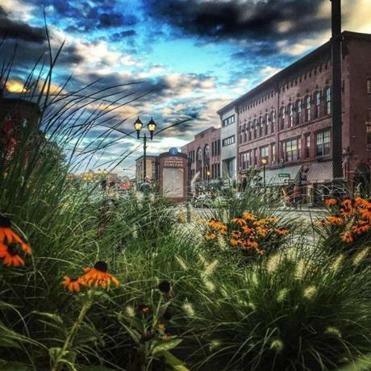 CONCORD, N.H. — The sun is out, Concord’s Main Street is revitalized, and it’s the perfect time to attend the day-long celebration at the Capital Arts Fest on May 6. Hosted by the Chamber of Commerce’s Creative Concord committee, the event is planned to showcase the best of Concord. Start off in the early morning, just in time for the reopening of the farmer’s market. This market is one of the oldest in the state, beginning in 1981, and boasts 40 vendors of fresh produce, fish, honey, and more. After getting your fill of fruits and veggies, take a Historic Downtown Concord walking tour, which will highlight the growth of the city, along with its political and cultural evolution. Whether you’re a Concord native, or it’s your first time visiting, this is a way to learn more about the capital city. Musical performances will be featured throughout the festival, with two headlining performances by the nationally acclaimed Squonk Opera. They’ll perform two 30-minute shows on City Plaza, at 11:30 a.m. to noon and 1 p.m. to 1:30 p.m. Other performances include the Suncook Valley Chorale, the Concord Chorale, and the Concord Community Music School, which is celebrating its 20th anniversary with recitals throughout the day. The transformation of Concord’s Main Street was the impetus of this event, said Tim Sink, president of the Greater Concord Chamber of Commerce. According to Sink, Concord has become a cultural destination, and the downtown is an increasingly desirable place to work, live, and shop. The McAuliffe-Shepard Discovery Center will be hosting shows for all ages. They will also be hosting Aerospacefest, which will feature fun activities and cool presentations to do with science and engineering. For visual art, walk around McGowan Fine Art and Mill Brook Gallery and Sculpture Garden. McGowan will feature art from Natalie Blake, Cathy Chin, and Amy Goodwin. Mill Brook will show a wide range of art, from paintings to sculpture to jewelry. Along with galleries, there are multiple Concord buildings that have visually interesting and historic architecture like the Capitol Center for Arts performance venue and the 19th-century Kimball House Victorian mansion, with hand-carved woodwork and marble fireplaces. The Kimball Jenkins School of Art is launching a bike project to run in Concord from May to October. All they need are old bikes and bike parts, two and three wheelers, and volunteers. Several artists and local groups will create artful bikes that can be welded, painted, and displayed along Main Street all summer long. At Gibson’s Bookstore at 2 p.m., join author and writing instructor Joni B. Cole as she reads from her new book, offering encouragement to beginning and experienced writers. The finale of the fest takes place at the Capitol Center for Arts, with a performance by comedian and New Hampshire native Justin McKinney. McKinney, who has appeared multiple times on “The Tonight Show” and on Conan O’Brien, has found New Hampshire provides him with a lot of good material. Tickets are $27.50. Concord Coach is offering 20 percent off one-way and round-trips tickets between Concord and Boston, South Station/Logan Airport. The coupon code is concordarts. It must be entered using lower case letters and is available for use now through May 10. The tickets can be purchased with the coupon code at www.concordcoachlines.com and may be used for travel between May 1 and May 10. Mayeesha Galiba can be reached at mayeesha.galiba @globe.com.